Home | Blog | Ask Our Experts: What is HVAC Zoning? Ask Our Experts: What is HVAC Zoning? Smart thermostats help control zoned systems. What is “zoning” and how does it work? I heard someone say that they have a ‘zoned’ HVAC system at their home, and I’m wondering what they mean. What is ‘zoning,’ why is it useful, and when might I consider it for my home? “Zoning” is simply the ability to have separate temperature controls in different areas of your home. It’s typically found in larger, multi-story homes; homes with finished basements; or homes with rooms that have unique heating/cooling requirements (for example, homes with “bonus” rooms over a garage, homes with sunrooms, or homes with lots of glass in certain areas). You might consider ‘zoning’ your HVAC system if you notice significant temperature differences from one room or floor to the next or if you’d like to help prevent premature wear and tear on a single HVAC unit servicing your entire home. What does the term “zoning” mean in layman’s terms? “Zoning” is simply the ability to have separate temperature controls in different areas of your home. For example, you may wish to keep your first floor at a moderate temperature while your bedrooms are cool and your den area is warm. Zoning may be accomplished in two ways: first, you might have specialized zoning equipment installed on one HVAC system that serves your home; alternatively, you might simply install two or more HVAC systems at your home, each one of which serves a different location in the home. Under what circumstances would zoning be recommended? Zoning systems are primarily installed in larger, multi-story homes and/or homes with unique climate needs. For example, a two-story home with a finished basement would most likely benefit from a zoning system, since air temperatures naturally change significantly from the basement to the second story. Other examples might include homes with a lot of glass windows in certain rooms or “bonus” rooms over garages – these unique rooms have unique climate needs; thus, it makes sense to segment their heating/cooling controls from those that serve the rest of the home. When is it important to zone, and when might be it unnecessary? Zoning is usually not necessary for small, ranch-style homes with lots of open space. A single, traditionally-installed HVAC system is well equipped to handle heating and cooling needs in this scenario. As mentioned previously, homeowners should definitely consider zoning if dealing with multi-story homes (especially two-story homes with finished basements), sunrooms, “bonus” rooms over garages, or areas of the home with unique architectural features (like high ceilings or many glass windows). For example, many two-story homeowners complain that the temperature varies significantly (sometimes as much as 5 – 8 degrees Fahrenheit) from one floor to the next. This issue can be effectively addressed by proper zoning. Click HERE for a related article on this issue in particular. Practically speaking, how does zoning work? Based on room characteristics and heating/cooling requirements, the home is split up into several different segments called “zones.” Each zone is monitored and controlled separately – independent from the other zones. In some cases, this might mean that each zone has its own thermostat (thus, if your home has three zones, you’d have three thermostats). In other cases, each zone has its own temperature sensors, but all of them feed back into one main, sophisticated thermostat that controls all of the zones. On the back end of the system, you might have one or more HVAC units powering the heating and cooling work for your home. If all of your zones are serviced by one HVAC unit, then special automatic dampers will be installed in your ductwork to allow the system segment air flow in each zone. Alternatively, you can install one HVAC unit for each zone of the home, thereby eliminating the need for more complicated ducting. Is zoning costly? Is it worth the investment? In some homes, zoning is a “must” if reasonable comfort levels are to be attained given the architectural features of the home. However, in many applications, zoning can be considered an upgrade. Some systems can be easily upgraded with the addition of automatic dampers and additional controls (like temperature sensors and thermostats). Other systems may require additional HVAC units to effectively accomplish zoning, which may become expensive. In any scenario, it’s certainly worth exploring the costs and then weighing them against the benefits of 1) a more fine-tuned level of comfort throughout the home, and 2) less wear and tear on a single system that would otherwise bear the burden of servicing the entire home. The experts at Tuckey Mechanical Services would be happy to walk you through these considerations to help determine whether a zoned system is right for your home. Is it possible to “zone” a system after it’s been built? Or is zoning possible only with new installations? Yes, it is definitely possible to zone a system after it’s been built. However, the ability to cost-effectively zone an existing system is dependent upon several factors, including the design of your original installation, the accessibility of existing ductwork, the existence of space for additional ductwork, and more. An evaluation by an HVAC professional would help determine whether it will be feasible to upgrade your existing system to a zoned configuration or not. Finally, keep in mind that there are many different ways to “zone” your home. Some are built around traditional furnaces, air conditioners, and heat pumps, while others are built around multi-zone ductless split systems (the systems that require a unit to hang on the inside of one or more walls – click HERE for more information). Tuckey Mechanical Services can design, install, and service all types of zoning systems for your home – and we’re happy to help determine which one is right for you! Zoning is something to consider in multi-story homes or those with unique heating and cooling needs. It’s most often easiest to zone your HVAC system during initial installation (i.e. new construction), but zoning can also be accomplished on existing systems. 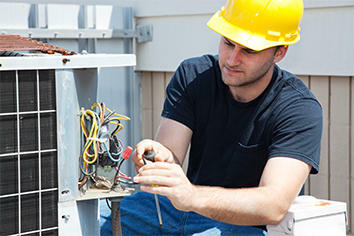 Consult an HVAC professional to determine the most cost-effective strategy for zoning your home.